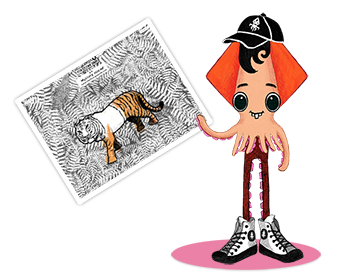 These are a few simple green tips for children inspired by our app, You and the Flying Squid on Turtle Island. Start from here and then go even further! Recycling is a very important habit to start teaching to your young ones. 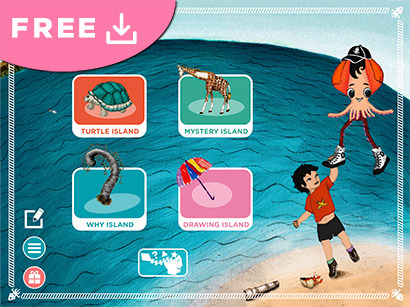 In the book, Turtle Island, we show two simple but fun examples of recycling that are very easy to teach to your child. 1. 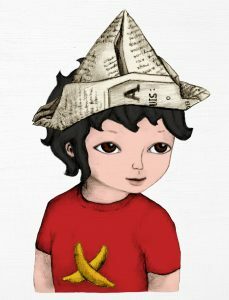 The man who always reads the newspaper uses one page from his newspaper to make Yuri a great pirate hat! 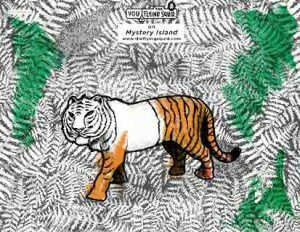 Screenshot from Turtle Island. You wearing a news paper hat. 2. 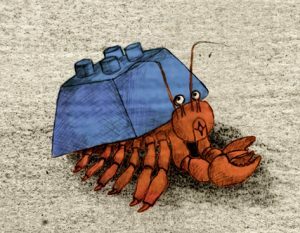 The hermit crab finds out a toy block left on the beach and decides to recycle it and reuse it as his new home. Inspired by these two simple examples, play with your child to reuse things from your home before they are thrown into to the recycling bin. The important thing is to be creative and inventive, and have fun. Let your child experiment and come up with his/her own ideas. Even if those experiments end up in the recycling bin within a few days they served their purpose (FUN & LEARN). Empty paper towel rolls -> Great for making a Pirate Spyglass. Empty jelly jars – > Drinking pirate glass. Old magazines – > Beautiful collage / artwork. This is just the beginning. The goal is to take an ordinary object, and with some simple craft tools, make it beautiful. You can get inspiration from a number of online sites, but we believe that it is very good to spend some time coming up with your own inventions. Spend ten minutes with your child thinking about how to reuse some of the stuff that you’re planning to throw away. You might be surprised by your child’s ideas. Let your child express those ideas. SHARE your great discoveries with us! We would love to hear from you and share some of your feedback on our social media sites. Every summer, many colorful balloons go sailing in the blue skies. While sailing balloons can paint a beautiful picture, they are very bad for the environment. Many times the wind blows away balloons to the sea, or they may land on fields to be washed out to rivers, and then to the ocean. You & the Flying Squid on Turtle Island. Educational Game. Since these broken balloons are very dangerous to wildlife, remember to tie them up strongly and don’t let them fly away. If your young child wants to hold one, make sure that the balloon is securely tied to his/her wrist. 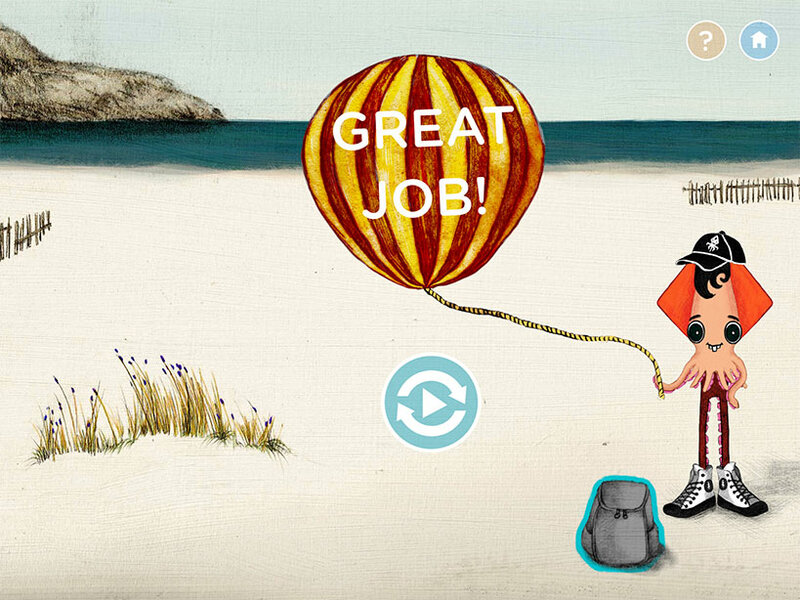 Tell your child to follow the example of Chopito, in our game “Clean the beach.” At the end of each game, he pulls the balloon back into his backpack! 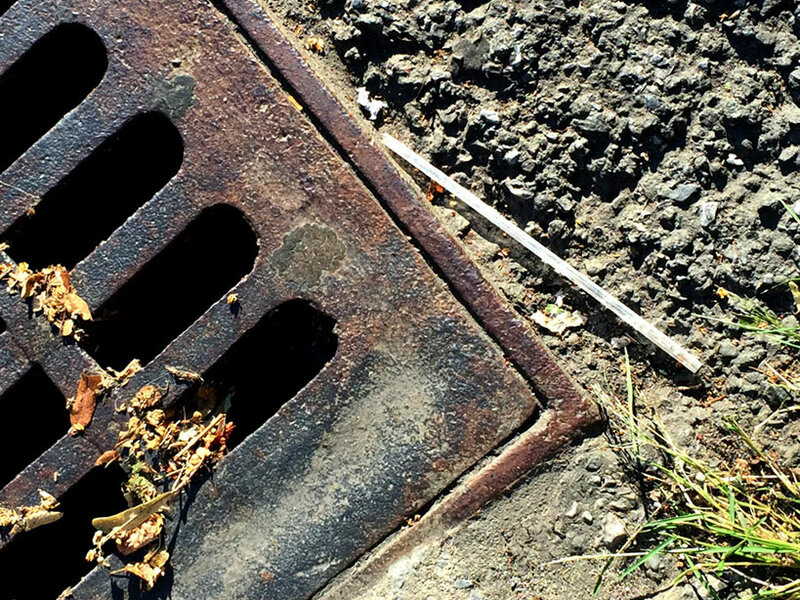 When the broken water balloons end up on the playground floor or in parks, there is a chance that when a storm comes, they will be washed into storm drains, to rivers, and then to the ocean. Depending on the area where you live, the chance of that happening to your child’s balloon(s) may vary. However, why leave them behind in the hopes that a public employee will pick up the balloons before they harm the environment, or that the city storm drain will prevent that from happening? It is great to let your kids play with balloons. After all, water balloon fights are one of the best things during summer. Just be mindful about asking your children to clean up after they are done, as much as possible. 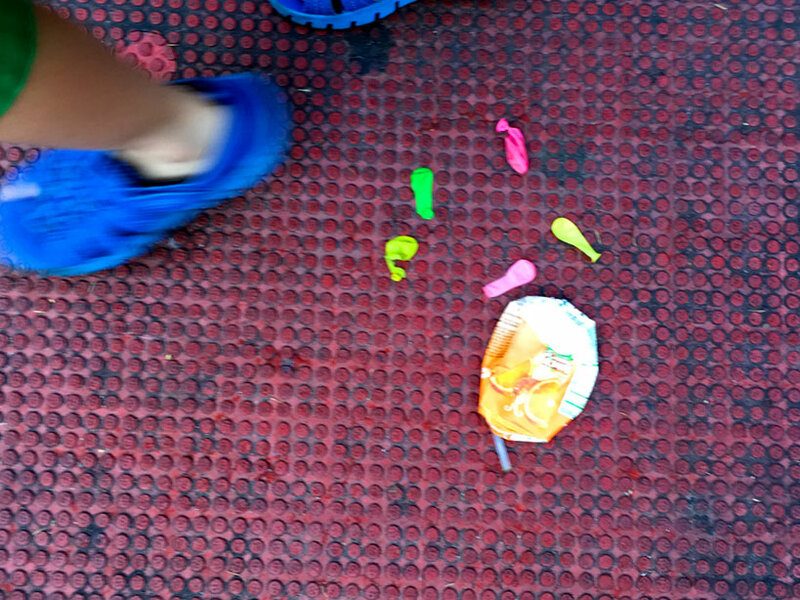 Broken balloons on the playground floor. This will be a difficult task, but it could be a life lesson. If they understand that you don’t litter even when playing, then you have accomplished something important! Parents can set the example by beginning the cleaning chore. It is definitely easier to do a quick tidying job before leaving the park than to pick up balloon bits from the beach or out of some animal’s belly. City playground. 107 pieces of broken balloons in a 8x2.5 foot area. 1. Reduce the number of disposable containers that you use for your kid’s lunch pack; try to wash out and re-use sturdy containers. 2. Sometimes, give your children ‘experience’ presents instead of ‘object’ presents. For instance, they might want a membership to the local aquarium, fun extra-curriculum classes, or maybe a family weekend trip to a local park. Your child will have fun and learn to care for the environment even more! An adventurous straw that wants to have some holidays in the ocean. The Art of Recycling. If you are out of ideas for our recycle game challenge , check these sites to get inspiration. I) The Australian not-for-profit organization Planet Ark Environmental Foundation published a long list of kids’ Activities for the National Recycling Week. All of these activities will surely set your kids’ recycling skills to the highest level. II) We found out about ScrapKins while strolling with the kids in Union Square. NYC. ScrapKins hosted a booth on Earth Day where we learned about all the cool stuff you can make with not-so-cool stuff. If you are looking for great artistic recycling inspiration, check them out. You can learn how to make the most adorable spiders imaginable! 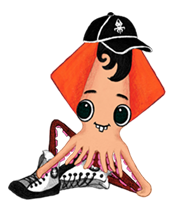 I) If you want to get hands-on and be like our hero on You and the Flying Squid, you can join the International Coastal Cleanup project and help to clean the shores all around the world. Used filters are a big problem, because contrary to common belief, these cigarette filters can take decades to decompose; when floating in water, they release all of the toxins that they are meant to trap and keep out of human lungs. Cigarette Litter, an informal non-profit organization, gives great tips to mitigate this major problem. III) The EPA (United States Environmental Protection Agency) has a vast amount of information that you can use to prevent marine debris.